Outcome thinking and balanced scorecards look like two unrelated approaches to managing performance and results in organisations. However, they have very close connections. Learn how knowledgeable application allows these two, apparently different approaches, to work well together. Some would say that the balanced scorecard is simply a set of measures, in various perspectives, that are used to manage performance. Some would say that outcomes (and the related Input – Output – Outcome model) is merely used to external outcomes. These people would be very wrong. Very wrong indeed. We often use outcome thinking and modern strategic balanced scorecards, together with our clients. In this article, I want to use our experience so look at the similar characteristics of these two approaches. How, when applied properly, they can work together very effectively. How are outcome thinking and balanced scorecards related? There are important differences between the approaches that inform how each approach should be chosen and applied. If you are unfamiliar with either approach, or want a more detailed understanding of how they work, there are links to resources at the bottom of the page. Charities: Fund providers, fund receivers and those looking to influence multiple layers of beneficiaries. Several UK water companies where their regulator, OFWAT, requires explicit outcome based thinking. Unfortunately the first connection between these approaches is that both outcome thinking and balanced scorecards are mis-understood, over-simplified and applied simplistically. Both the balanced scorecard and outcome thinking have a rich vein of thinking and clear principles, that get ignored. It appears a simple model. However applied simply it often fails. 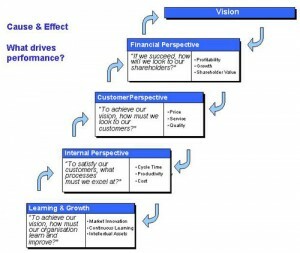 Norton & Kaplan wrote five books about the balanced scorecard approach and how it can help strategy and change happen. I often think that some writers have never read beyond page 9 of the first book. I wrote over 300 pages in my book “Strategy Mapping for Learning Organisations” which describes the fourth generation balanced scorecard approach I use today. However what I wrote is not the whole story – we had to cut pieces out. It is the same with outcome thinking and the input-output-outcome model: applied simplistically, as much public sector and other literature describes, it appears a simple model. However applied simply it often fails. Many applications ignore the Logic model and Theories of change that sit behind the approach, Few realise it has origins if evaluation that give it a particular perspective, but that deeper reading and explorations allows you to see how the approach can be used internally as well (as I explain in the outcome thinking paper). The first and most obvious link is in how outcomes should be defined. Outcomes are always stated from the perspective of a beneficiary of customer. They are the outcomes that that person (or group of people) want. They are always from the customers’ perspective. Now you will see very poor examples of outcome thinking where the outcomes stated are simply what the organisation provides. These examples are both incorrect and dangerous. The outcome is always a change for the customer or beneficiary, from their perspective. So often what is written as an outcome is really merely an output: what the organisation provides. Interestingly this same mistake, thinking what you provide is what the customer wants is very common in poorly designed balanced scorecards. So often I see statements in the balanced scorecard’s Customer perspective (the clue in in the name) where the organisation is describing what they will provide, NOT what the customer wants from their perspective. In good balanced scorecard design, the customer perspective should contain objectives stated from the customer’s perspective. Ideally statements of the form “I want….”. where the customer is the subject of the sentence. Exactly the same is true with outcomes. They should always be stated with a beneficiary in mind, and that beneficiary made explicit. 3. How is change modelled, in outcome thinking and balanced scorecards? This model is far more sophisticated than the simplistic inputs/outputs and outputs/outcomes are measures of efficiency and effectiveness that gets applied in the public sector. It is about tracing the logic of the model and exploring the organisation’s goals and strategies for influencing and bringing about change for the beneficiaries of the services that are using the funder’s money. (You can read more about this is our paper on the underlying principles within the outcome thinking model). In other words we are describing how change is expected to occur. In the case of the outcome model its origins are about the fund provider evaluating whether the organisations models of change are valid (before they hand over the money) and are working (after the money has been applied). Guess what, we have a completely analogous approach within the balanced scorecard. I assume that you are beyond the stage of thinking that balanced scorecards are merely collections of measures in perspectives. (If not please have a read of my articles on cause and effect and strategy maps, or watch my very popular strategy mapping 101 video). Now what this model is doing is teasing out and describing a model of change. A strategy for change. A causal relationship that explains how the strategy will have an effect. What it is doing is clearly establishing links BETWEEN the objectives in each perspective. This is most important: I always tell my clients that the links between objectives are more important that the objectives (or at least as important). Please don’t go away from this articles thinking that I am saying these approaches are the same. The balanced scorecard asks for objectives in the process perspective: the input, output, outcome model looks for outputs from the processes. These are quite different. One is an objective for the process that can also be used to describe the qualities of the process whereas the outputs merely refer to what the processes produce. THEY ARE QUITE DIFFERENT! The balanced scorecard asks for learning and growth objectives in the lower perspective. The input, output, outcome model looks for inputs (but does not characterise them as objectives, nor as capabilities that will drive change). The balanced scorecard is quite selective: As you work through the balanced scorecard’s cause and effect model, you should be asking “What are the few things that will make the biggest difference?”. Th inputs, outputs, outcome model is asking you to list all the inputs that go to create the outputs: Again, VERY VERY DIFFERENT. The Balanced Scorecard is about executing strategy in an organisation to bring about internal change as well as, eventually, changes in the external world. The input output outcome model is primarily about testing whether the activities will bring about the outcomes for the beneficiaries. Again quite different. The balanced scorecard is primarily a tool for internal performance management and strategy execution. Its customers are the internal managers (though some parts may be provided externally). In contrast the Logic model that underpins the input, output, outcome approach is primarily for external evaluators. External bodies looking to see if the organisation is using its funds well. Again a very different starting point. So we have established that there are some differences between outcome thinking and balanced scorecards, but that both approaches, have some important common overlaps in their underlying thinking: both outcome thinking and the balanced scorecard, seek to define the benefits for external parties (be they beneficiaries or customers); both approaches are looking at the strategies for change and drivers for change; and both ask, how will this change come about. In fact, there are many more areas where, deep down these two approaches have similarities: areas that mean it is very simple, when applied properly, to link an approach that looks like one for external evaluators (outcome thinking) to the strategy delivery and performance management approaches internally that are often supported by more modern strategic balanced scorecards and strategy maps. So the important message here is, that these are not separate approaches. When you understand how they both work in principle, more deeply, you find it is easy to fit them together into a coherent approach. When you do this you avoid a lot of wasted time and effort that duplicate performance management approaches create. Talking with a client yesterday we were lamenting that both outcome thinking and balanced scorecards are poorly understood. Also, that both are applied simplistically. Both are rich techniques, with many similarities and common thinking deep down. The common thinking is both logical and reveals a rich application and practical experience. Unfortunately this richer, more sophisticated and more valuable thinking gets ignored. Please do not ignore the rich thinking that lies behind these two approaches. It is likely to lead to poor implementation. If you are struggling to apply either of these two approaches, or even combine them, do give us a call. There are times when 15 years of experience can save you a lot if time. As a minimum have a read of our outcome thinking paper and watch the Strategy maps 101 video. You will see where these are similar. And when you want a longer discussion, or to solve specific problems in your organisation, give us a call. If you are interested in our Inputs, outputs, outcomes white paper, then follow this link to obtain a copy. If you are struggling with outcomes, or the Input, output, outcome model, or Strategic Balanced Scorecards, and want training or expert help, then simply get in touch.